The following table provides information and tips for entering advanced IMAP settings. 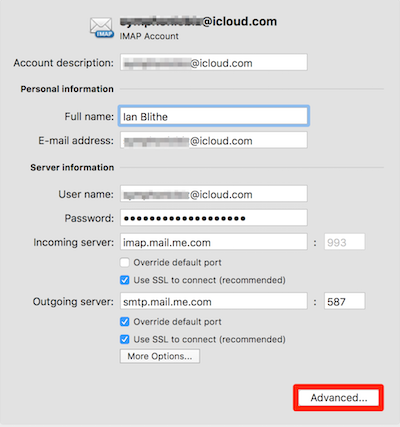 To access these settings from the primary IMAP Account preferences dialog box, click the Advanced button, and then click the Server tab. With this preference turned on, only message headers are automatically downloaded to your computer. Therefore, large messages (and any attachments) are downloaded only if you select them in the message list. However, when you are offline, you cannot read the message bodies or attachments. Enable this option to download message headers only for folders other than the Inbox. Use this preference to set a server connection schedule. If this preference is available for your e-mail service and you select it, Outlook automatically updates your IMAP folders continuously. IMAP IDLE eliminates the need for you to run the Send & Receive command for the account. Discontinue the connection﻿ with the server after a specified amount of time. If your e-mail service requires this, you can specify the path of the root mailbox on the server that contains all your mail folders.